After lunch participants could choose between three parallel session. 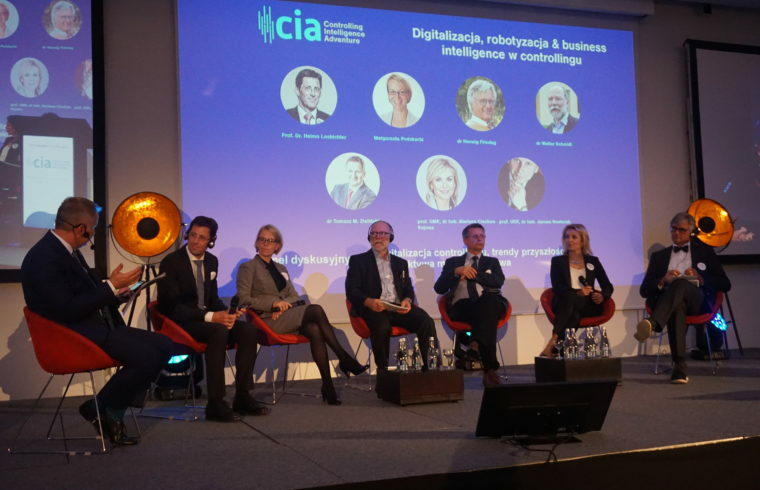 One of them was a discussion panel: Digitalization of Controlling, Future Trends – International Perspective with: Prof. Dr. Heimo Losbichler, Chairman of the Board – ICV, Małgorzata Podskarbi, Member of the Board – ICV, Dr. Walter Schmidt – ICV, Dr. Herwig Friedag – ICV, Dr. Hab. Marlena Ciechan-Kujawa, prof. UMK, Dr. Hab. Janusz Nesterak, prof. UEK, Dr. Tomasz M. Zieliński – ICV POLAND. The panelists answered the question of controlling philosophy by the IGC / ICV and what advantages a company has by introducing it. There was also a discussion what skills controllers need: although the participants talked a lot about analyzing data and planning models, they stressed out that the most important skill is communication: talking to the manager, talking to the customers, being able to convince people to new solutions… Nowadays it’s also important to know languages and understand cultures of particular countries – because only this way controllers will understand business and managers will understand controllers. Panelists argued also if and how digitalization will change controlling and what threats it brings.